Readers keep bugging me about details on the glyph industry, my moneymaking mainstay. I wrote several articles covering different points, now I write one big summary and will link it on the about page. The scribe uses inks and parchments to make glyphs. (Surprise!) Jessica Sellers is kind enough to sell us any inks for the highest level ink. Inks come from pigments. Pigments come from milling of herbs by scribes. Milling provides "white" inks, used for glyphs and "green" inks, used for various things. Most of these things are non-profitable, except the usage of the highest level green ink, snowfall ink, which is used to craft epic offhands, darkmoon cards, inscription research and inscribes self-enchant for shoulders. The buttons show the herbs and have a number on them showing how many herbs you got. To make the milling profitable the price of the inks must be higher than the price of the herbs. This seem to be obvious but it's not, since the "price of the inks" is not a properly established market price. Most scribes mill for themselves and not buy or sell white inks, therefore Auctioneer returns some random number as price of the inks. Tip: sell inks. There are people who want a glyph, find it overpriced and wants to buy ink to bring it to a guild scribe. So there is market for single inks, I sell them for 5G. You must define a price to the Ink of the Sea. This is an internal transfer price between your milling and glyph-crafting industry. This price determine the bottom price of the glyph. If you set it to 2.5G, you must not sell any glyphs below 3G or you are at loss. Of course if you set this price too high, you find too many "cheap" herbs and too few sellable glyphs, so you'll soon be drown into inks. You must modify this price according to your ink deposits. If they become too big, decrease the ink price (this will decrease herb price limit, so you'll buy less, and decrease glyph bottom, so you'll sell more). Captain obvious says that if you find inks below your price or pigments below your price /2, you shall buy them instead of wasting your time with milling. Don't just check for Sea, you can find other inks/pigments too. El has measured how many pigments come from the different herbs and found that it depends on the level of the herb. The first digit of the level defines what type of pigment comes (7x herbs give Sea, 6x herbs give nether). The second digit defines amount gained. It's 2.5+x*0.05, (so 2.6 pigment for the lvl 72 Deadnettle and 3 for the lvl80 Icethorn). The green pigment (Snowfall for 7x herbs) comes in the amount of 0.24+0.036*x. After this price is determined, go to the AH and buy the herb with the lowest relative price. Relative means that an adder's tongue at 1G is cheaper than a felweed at 0.5G (since 1/1.16 is smaller than 0.5/0.55). When milling for "other inks", keep in mind that they are not interchangeable. So even if you can buy felweed for 0.1G, you can only use it for eternal ink and no other. However buying eternal ink from Jessica while cheap felweed is available is also a loss. Note: for maximum profit, consider the herb "normal" price, not the actual price of the stack. If you see 50stacks of Deadnettle for 60s and 49 stacks of Goldclover for 70s and 1 stack of Goldclover for 20s, mill the nettles and flip the 1 stack of Goldclover. Note2: Snowfall price cannot be higher than 10x Sea price, since Jessica Sellers sells Snowfall for 10 Sea. So if the Snowfall has some insane price on your server, make some profit on it. Since time is money, you can cut the herb buying and milling part if you make a business with a non-goblin scribe. Tell him to CoD you Ink of the Sea for your price. He can keep the Snowfalls and make some profit. This profit is around 1G/herb, not a bad income for buying herb, milling them and crafting the ink. If you made all the researches and bought all the books, you have 343 glyph recipes and 6 vellum recipes. If you have not finished research or not bought all books, you can and shall start. Some need 2 inks, most need 1 and also a parchment. If you have the addon "LilSparky's Workshop" the AH price of the glyphs will be listed on the crafting window. There will be 2 columns, first is the product price, the second is the crafting price, but this is useless, since the ink prices are screwed. Those glyphs that has higher price than your base price (ink + parchment + minimal work fee) worth looking at. The first data you must look at is the auctioneer undercut price. The glyph prices are very hectic, so the middle price is just a first filter. Auctioneer writes a price to the lowest row and a text telling "undercutting competition" or "competition above market" or "no competition" or "cannot undercut". If it's "cannot undercut", don't craft. If the undercut price is too low, don't craft. If you have Possessions and Whohas addon, the tooltip shows how many glyphs your bankers have. Of course get all mail from the mailbox before you do it. You must have bankers since 4 scribe bags and a backpack hold only 144 glyphs. I have 3 bankers, beginners may run with 2. Theoretically you could use your bank, swapping bags but then you'd have no place for your raiding stuff. If your inscribe is an unguilded alt, you can get a guildbank to hold your extra inks. Always have at least a week's ink in the bank (or in an alt's bag), otherwise you may run out of inks in case of a herb shortage. If you already have enough glyphs, don't craft, otherwise fill up your stocks. Of course "enough" depends on your pricing strategy, described tomorrow. You can just make enough glyphs to fill all up to 8 or 10, but there is a method to decrease workload during it. Craft all glyphs (except those that has price under production cost), not just "flavor of the week". The guy with glyph of innervate is maybe stupid (or rather raids with stupids lacking replenishment) but his money is just as good as Kungen's. I found no mean to automatically create more than one type of glyphs, a mod that would create 5 glyph A, 10 glyph B and 4 glyph C for one click would be a salvation. Since I know of none (and maybe cannot even exist due to Blizzard restrictions), you must sit by the crafting process. There are addons that allow you to queue crafting up, but you always have to push "continue queue", so no point. The time limiting factor is the crafting itself, I use this time to manually look at the next glyph, determine how many to craft. In part 2, I'll discuss pricing, undercutting and mass-listing. Since these posts are kind of "sticky" (that's why they are on the about page), I will cleanse the comments often, after incorporating their data. So it's not disappeared because you was considered "troll" simply because it's answered in the post. I leave only comments with data that does not fit into the post or I had no time to check it out. For those who don't sell via alts - if you hold the "Alt" key you will see Y (X) in the left column of Lilsparky instead of price. Y is the amount of items that Auctioneer have seen on AH, and X - amount of items you have. So you don't need to moseover everything. Shame i don't know the way how to configure it to show glyphs on alts too. What I use to craft the glyphs is Skillet. It lets you queue glyphs as you find them, then has built in options to buy the paper and inks you need all in a click. The actual creation seems like it should be a one click process, but for me the creation process stops after I make a glyph. However, even with that it's easier to click one button 100 odd times than it is to search through the skill book for each individual glyph. to see how many of each glyph i have in total i added a few lines of code to lilsparky'sworkshop. you must also have the Altoholic addon as it totals what you have in inventory, bags, alts, AH. 5. Come back and visit AH and post them all with appraiser. Try "bankitems" addon - it will also display the number of glyphs in the guildbank in the tooltip. However, I use Bankitems plus Altoholic. Theres an addon for skillet that uses the altoholic data to place the number of glyphs your alts have directly to the skillet crafting window. In my oppinion the profitability of glyph mass production its not really dependant of the server population. The crucial question is, how many mass glyph producers ( at worst: goblin style :) ) are there on your server? If demand is not high on your server but the margins on single glyphs are high, you can make a lot of gold. Im playing myself on a high pop server, but there are about 6-8 mass glyph produvers, and that cuts the earnings immensly. You can count on being undercut in about 15 minutes, no matter of time of the day. So just check the ah and try to evaluate how many glyph players you have - but keep in mind that (not the last because of gevlon) the glyph production idea ist still rising. You need several thousand of cash to start up, and you have to stay on the market consistently. 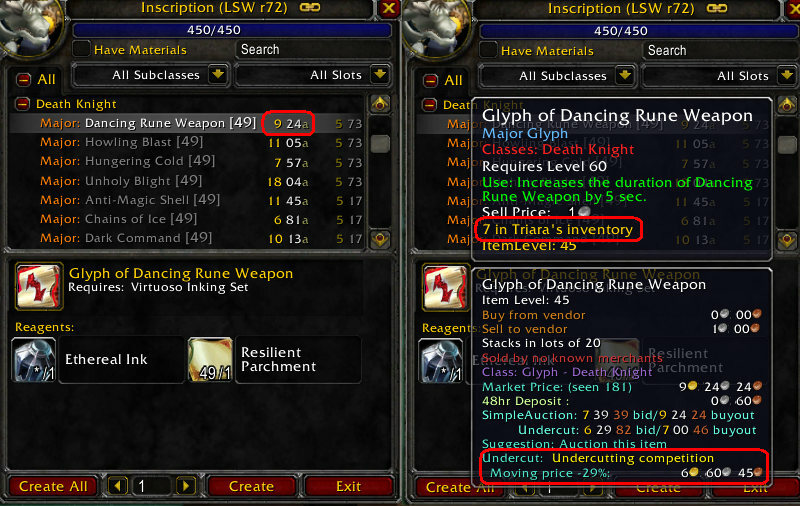 Question for Gevlon: I find auctioneer's prices for glyphs out of whack with reality. Any idea if there is an easy way to reset them, short of wiping my auctioneer db completely? I'm currently sorting my glyphs by auctioneer sell price and crafting about 3 of each down the list until I get bored. As mentioned previously, Altoholic and other addons will include the number of items in the guild bank in the tooltip. This allows you to give your AH mule his own guild and bank storage. You can have 2 tabs very reasonably which will be more than enough storage for your glyphs. I am using this arrangement and it allows me to store all my glyphs on a single character which enables me to use the other alts for other types of sellable goods. The only thing I do that is somewhat different is maintaining an inventory of glyphs. I try to maintain close to one stack of each, so that I am making glyphs only every 4 days or so. This gives me a good idea of exactly how many I need to make and cuts down on my overall crafting time dramatically. You have a lot more overhead initially doing it this way... but the time saving later is worth the initial investment. It's far easier for me to see that one stack of glyphs has only 4 left than it is for me to scroll through my list of successful and failed auctions. Also, to add to the importance of controlling ink prices. If you are buying up the inks, competing glyph makers are forced to mill themselves or to buy inks at higher prices. They will have to either spend more time milling, or lose profit if they are just buying inks. I have found that on a server with many incriptionists that it has become very difficult for them to keep up with the sheer number of glyphs to be made since I started paying attention to this. Always keep a large stack of cheap herbs and inks nearby for when someone else catches on to the idea. I try to maintain 100 stacks of herbs and more than that in inks for when someone starts buying out inks from under me (or the price gets to high). For the people mentioning macros to move things between bag and banks - take a look at Dumpster which does the same thing but you can specify name, type, amount, etc. At the very least, you can make a queue using QA2 or something similar (skillet i think? ), and just mindlessly press the 1 button. Note: if your press at just the *wrong* time, you'll make an extra of the glyph you just crafted instead of the next in line. I've had the issue with both Skillet and QA, so i assume it's some kind of client->server lag. The author of My Auction House Banker is working on a mod that does "create 5 glyph A, 10 glyph B and 4 glyph C for one click." He's shared it with a few testers and they absolutely love it. Well, I have been following Gevlons advises for 4 months now and increased my monthly profit from 3k to 40k. I always have ~1100 auctions up and even with 4-6 other mass producers on my server I sell a lot of them. I recently switched from auctioneer batch posting to quick auctions 2 (mainly because one of my competitors started undercutting me every time I posted my glyphs, so that helps me cancelling undercut auctions). It takes the data from your beancounter and puts them in a handy excel sheet with pivot tables. Gevlon, have you investigated the selling of items obtainable with low-level Darkmoon Faire decks? Not the decks themselves, but the BoE items gotten from their quests. I am asking because I have found that the shoulders obtained from the Decks of Swords sell really well, especially on a server with a relatively WoW-new population. This might make the low level green inks worth something. Regarding the amount of time it takes to mill - a solution for some. If you have a programmable mouse, keyboard, or secondary keypad (ie Belkin Nostromo), you could create a macro that will press the mouse button every so often (3 seconds seems right) in a loop. The Auctioneer module Enchantrix has an Automation function for milling. It kicks in when it sees an herb go into your bag - ie from the mailbox. Use Postal or other mail mod to grab all attachments from your emails. Automator will bring up a screen asking if you want to mill what's just been dumped in your bags. What makes the Enchantrix Automator better than regular macros I've seen is that it's smart - if there's not a full 5 stack it wont hang up, it just keeps going. And if more of that herb get dumped in your bag from a second or third email that makes a 5 stack, it adds them to the queue. If you're an alchy and want some of the herbs for pots, make sure you grab those first and tell automator to skip them for that session or the button click macro will mill them if you arent' watching. But that's the point of this - not watching the screen while milling a hundred stacks of herbs! So: install & configure Enchantrix to mill, have a mail mod, choose which mail messages to open, position the cursor over the right button in the Automator window, and run your keyboard macro. Disclamer - some say that Blizz considers keyboard/keypad automation apps against the Eula and if they see the software spamming the game might flag you - use at your own risk. But I've used a keypad with scripted commands for 3 years and haven't had a problem. The game shouldn't see anything but mouse clicks every 3 seconds - the same as if you were doing it yourself. This might not be the best place to post this, but since this is a fresh post on glyphs and Gevlon mentioned the time it takes to mill (and we all feel his pain) it might be useful to someone. Buy up all the ink of the sea @ 1.5g ea. I had a spreadsheet crafted up to tell me the yield of the 2 herbs. The low grade NR herbs and the higher grade NR herbs. I personally have a ballpark limit as to how much I think ea item will cost. Although at this pricing, the cost per ink of the sea milled from high grade NR herbs is around 50% more than that of the low grade NR herbs, but the sale from the snowfall ink will make up for the shortfall. I will usually buy up all the inks and herbs when they are at or below my stated pricing. Next, you can basically start to craft glyphs and sell and research new glyphs everyday. Some are useless, some are useful. Depends on your luck and server i guess. Before you start, you need to do a full scan of the AH to get the most recent data. Thats because all the glyphs either consumes 1 or 2 inks to craft. Using 2g per ink as a benchmark. 1-ink-glyphs cost a maximum of 2.5g to craft and 2-ink glyphs cost a maximum of 4.5g to craft. Mouse over the glyphs in your craft window and see if the lowest price can be undercut for a decent profit. Depending on your server and how much you intend to sell, you might have a different limit. I know some guys who only craft and sell 1-ink-glyphs above 6g and 2-ink-glyphs above 9g. Feel free to use a different threshold. When you decided on crafting a certain glyph, the next step is to determine how many should you craft. Initially, I only crafted 3 per glyph. But then I realised I couldn't figure out or guess what the players might buy on a certain day. Sometimes glyph A sells well, sometimes glyph B sells well. All I can do is to provide sufficient amount so that I will have enough goods to sell. Furthermore, the deposit costs are so low that you don't really have to worry about your auctions returning as unsold. Missing a possible sale costs more than an unsold glyph. So I crafted 5 of ea (which falls within my criteria) and post them up. Based on the prices of herbs on your server, I would ignore the low grade NR herbs and simple buy and mill the High grade NR herbs. Although simply buying ink of the sea would be more time efficient. I am lazy to mill. Try using ProfessionBars for your milling purposes. I found it working very well for me. Really great blog!! !Thank you so much! If the sell price is above your minimum threshold, wouldn't you want to craft it anyways? Is it because you don't want the market to drop too fast, or a limitation in how Auctioneer batch posting works, or something else? How do you automate inventory management? Moving hundreds of stacks of glyphs around between banks and bags is not a trivial task. I was using the BankStack addon (http://www.wowinterface.com/downloads/info7761-BankStack.html) but it will not work with profession bags. It worked fine when I only had frostweave bags, but when I switched to inscription bags it refuses to fill items from bank->bags and vice versa. It works for the 16 backpack slots and stops. Any ideas? What are other people using? What is missing from the equation to make it equal to the values Gev posted (1.32g) and (1.16g)? Anon you need to divide the resulting number by 5, to get the single price of the herbs. I believe the equation is sound. 1.16 and .89 could have been typos. How were the coefficients to sea_price and snowfall_price (eg. 1.5 and .3 for lvl80 plants) calculated?